Inner Rambling of a Mid Life Mama. : Happy Hour Friday!!! RxBambi... her heart is still in Mexico, romancing with Bob. time and that she shared some awesome pictures of what looked like an awesome trip. outside of the damn house... not even close to check!!! sigh. point... happy, happy, happy to be taking my class!!! eggs and ham and peanut butter. But I'm happy! Soccer season is finally over... this makes me happy!!!! Well done girls!!!!! I know you're asking yourself, why, pray tell,is Syd not in her soccer gear? could not play the last game but by God she was gonna be there to cheer on her team!!! She's a trooper that one and that makes me over the moon happy!!! it would make you all so depressed that you're not me living my fabulous life!!! 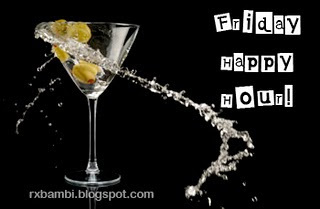 Now, get on over there to Bambs and check out the other Happy Hour Fridays!! Syd really is a little trooper! Good for her! Hope her mouth is doing better! Here to follow from Friday Follow! I would love to have you stop by my new blog, Lemonade Mommy. I also have a blog devoted to pet freebies and deals, My Pet Savings. hi here to follow from follow friday. I loved soccor growing up. still do. we have a semi pro team by our house that I will be ordering tickets to go and see play. great pictures. I'm glad you're happy! Hope you have an awesome weekend! Dude. You need to check your link. it always goes to some post on December 11th or something! lol! thanks for playing HHF this week, sorry it took me so long to get here! I think it's great that his gorgeousness is so handy. I'm not blessed like that, but he's still pretty damn good. are we on for tmro night live and on wine?? nice on the remodels...we need a new tv...kids sports are fun, but when they are over you seem to take back sucha chunk of time. hope you are having a great weekend! Congrats on the weight loss! I have fallen off the wagon in a huge (as in the size of my arse) way.